Size: 38.6 x 25.6 inches. Condition: Paper age-toned and dusty, a few brown stains. 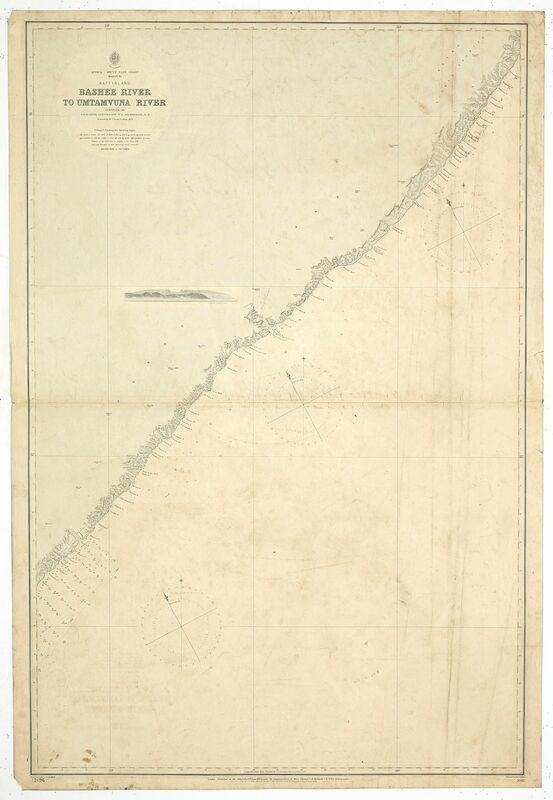 A fine Hydrographic Office chart no. 2087 (2196), showing the coast of Kaffirlandl. Engraved by Edw.d Weller. London : Published at the Admiralty 30th June, 1873, under the Superintendence of Rear Admiral G. H. Richards... Hydrographer : Sold by J.D. Potter agent for the Admiralty charts, 31 Poultry & 11 King Street, Tower Hill". According to the information on the chart Lieutenant W. E. Archdeacon. R.N. has been assisted by Mr F. Purdy, Civilian 1872. Magnetic variation in 1900 decreasing about 2' annually". With a coastal profile.